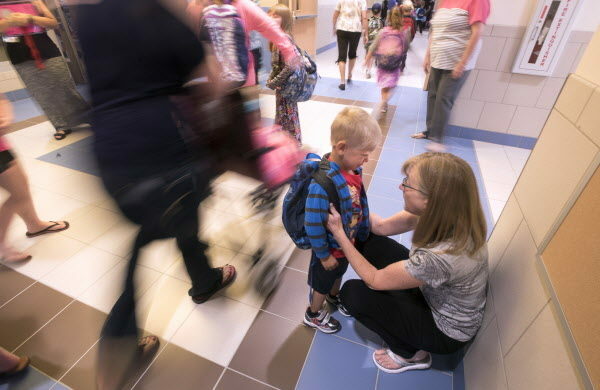 Caryle Janicki, a special education teacher at the new Central Community Elementary School, talks to three-year-old Noah Werenko to help him find the pre-kindergarten classroom on the first day of school in 2016. I have spent my entire life with teachers. I was raised by one, taught by many, have been one myself for 23 years, and have watched my 9-year-old son’s life be touched by several very special ones. I have seen the highest highs and the lowest lows the teaching profession offers. I have watched students soar to unthinkable heights, and I have cried at the funerals of students who never had that chance. I made the decision in seventh grade to become a teacher and I have never, even once, looked back. Being a teacher has become as much a part of me as being a daughter, sister, mother, or friend. It’s who I am. I’m a teacher. I recently read of Donald Trump Jr.’s comment about “ loser teachers.” I have spent several days pondering how to react to this. I wondered if I should even dignify such words with a response. I asked myself how my pillars and heroes, the teachers I look up to the most, would respond. After much thought, I decided that my most esteemed colleagues would do what they always do; they would use their “teacher voice,” speak their truth, and most importantly, they would teach. The teachers who taught me as a child — they were not losers. They were great woman and men who believed in me, inspired me, motivated me, challenged me, and told me I could become anything I chose. And I chose to teach. My father, a teacher of 43 years, now retired, is not a loser. He taught students with severe behavior disabilities. He loved the students who were the most difficult to love. He mainstreamed countless children who, without him, statistically were likely to become dropouts. His classroom, run with firm but kind, tough love, was a place where everybody felt like a somebody. The teachers I work with are incredible people. They motivate me every day to be my best self. They work nights and weekends. They lose sleep worrying about kids who are hurting. They buy food and clothes for children living in poverty. They fist pump to celebrate the small successes of that child they refused to give up on. They cry for the student living in a situation that no child should ever have to endure. When they are tired, run-down, sick, and feel like they have nothing left, they still find a way to give. And give they do, every single day. These people are not losers. My colleagues shine the brightest lights in the darkest places. My son, in his six years in the public education system, has already been given priceless gifts by his teachers that he will carry with him always. His teachers have taught and modeled compassion, kindness, community, grit, conservation, originality, inquisitiveness, humor, work ethic, and tolerance, to name just a few. My son has grown to love learning and has been taught to use his knowledge to help his city and the world. These skills will carry him far in life. My son’s teachers are not losers. They are beacons of hope. Teachers are thinkers, builders, supporters and believers. They are encouragers, dreamers, fighters, advocates and planners. They are motivators, learners, helpers, doers, rescuers and caretakers. Teachers are so many things, to so many children. Teachers are life-savers. Donald Trump Jr. is wrong about teachers. We chose our path and we chose wisely. Our lives are filled with honor, dignity, purpose and unconditional love. Shianne Priest is a music teacher at J.A. Leonard Middle School in Old Town.